South Africa and Nigeria have always been in a supremacy battle on who is the number one in Africa. According to the 2018 National Budget of Nigeria, the Federal Ministry of Science and Technology received ₦75,677,747,631 ($209m) and ₦5,573,471,146 ($15.4m) of this was allocated to the National Space Research and Development Agency (NASRDA) headquarters located in Abuja. 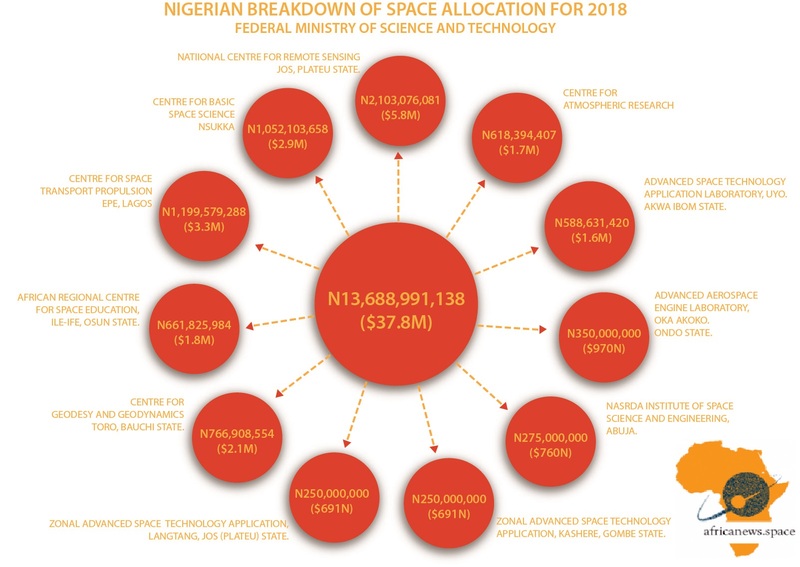 A total of ₦13,688,991,138 ($37.8m) was budgeted for space science and technology which is approximately 18.1% of the total budget of the Federal Ministry of Science and Technology. In contrast, South Africa’s Department of Science and Technology (DST) budget this financial year increased to R7,79 billion ($550m) – out of this, the South African National Space Agency receives R138 million ($9.7m). This is an improvement on the last financial year’s budget for the space agency which was R131-million ($8.6m). The Square Kilometer Array project receives R709 million ($50m) this year; altogether, approximately, R 847 million ($60m) about 10.9% of the total budget of the department of science and technology is spent on space activities. The allocation will be used to address transformation, through key research, development and support initiatives. 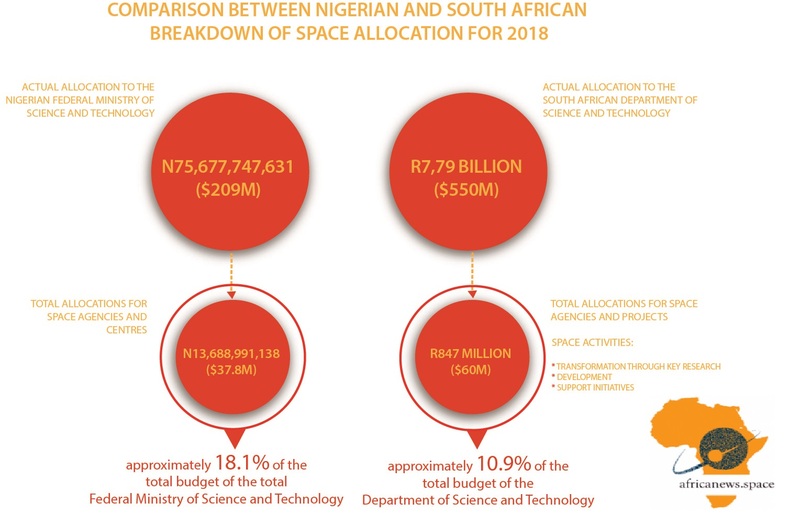 South Africa’s department of science and technology has more than twice the budget of Nigeria’s Ministry of science and technology even though only 10% of the budget is spent on space science and technology compared to Nigeria’s 18.1%. South Africa’s total allocation for space is $22.2m more than Nigeria’s. The major part of South Africa’s funding is going into the SKA project with the agency also pioneering the Pan African Institute of Space Science in collaboration with CPUT. South Africa’s influence on Small Satellite development is top notch in Africa after building and launching 3 nanosatellites (ZACube-2, designed and built mainly by postgraduate students at the Cape Peninsula University of Technology (CPUT) in conjunction with SANSA as part of the CubeSat programme will be launched before the end of 2018. Nigeria on the other hand is working towards the establishment of an Institute of Space Science and Engineering which aim to offer postgraduate training and courses on space applications and space engineering. 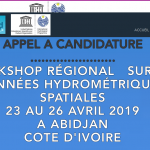 In the past, the centre has worked with local institutions like the Federal University of Technology, Akure on small sat development – the NigeriaEduSAT project and is also working with Landmark University on the development of another nano-satellite even though most of these endeavors are highly dependent on foreign partners. With the establishment of this institute, the nation is expected to build more capacity development on small satellite technologies and space applications. Nigeria is also in the race to host the proposed African Space Agency, according to a top official in the agency, the country has offered $10million to the African Union to host the agency and is currently building a Satellite Assembly Integration and Test Centre at its headquarters. Nigeria established the National Defense Space Administration on October 9, 2014 to ensure the nation is safe through space management, security and implementation of strategic policies. This include supporting Nigerian Military operations both within and outside the country as well as Security Agencies responsible for internal security through the use of satellite. The country’s total budget for Ministry of Defense is ₦576,399,335,199 ($1.6b) while the budget for the Defense Space Administration is ₦2,908,238,348 ($8m). This shows only 0.5% of the country’s total budget for defense is allocated to the National Defense Space Administration. However, ₦111,984,857,146 ($311m) is allocated to the Airforce, ₦224,253,578,978 ($623m) for Nigeria Army and ₦97,133,068,662 ($270m) for the Nigerian Navy. For South Africa, the total budget for the 2018/2019 financial year is R47.9 billion ($3.2b), a little less than the R48.9 ($3.3b) allocated for 2017/2018 financial year. Although South Africa does not have a defense space agency, R6.416b ($433) of the total budget for defense is allocated to air defense, R4.425 ($298m) for Maritime defense and R16.234b ($1.1b) for landward defense. It is expected that a good part of these allocation would be spent on space technologies for defense purposes.